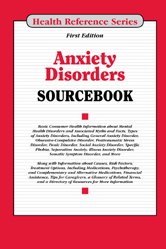 Anxiety Disorders Sourcebook, First Edition provides an insight about the ways people encounter anxiety and its various types, including general anxiety disorder, obsessive-compulsive disorder, posttraumatic stress disorder (PTSD), and panic disorder. It also provides information about chronic illnesses due to anxiety and ways to overcome it. Section 1.1— What Is Mental Health? Section 11.4— How Is Posttraumatic Stress Disorder Measured? Section 14.1— What Is Social Anxiety Disorder? Section 25.1— Are You Considering a Complementary Health Approach?